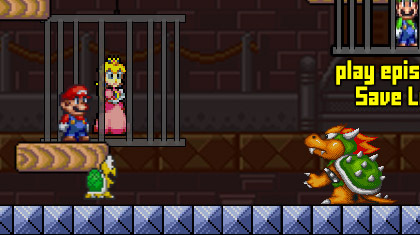 In Mario - Save Peach, the purpose of the game is to fight your way through 8 hard missions to save the little princess. To help do this, there is a small tutorial through which you can learn how to play the game. If you do not want to go through the tutorial, feel free to read the instructions here. One task is more difficult than the other. See which plumber is in you and free the princess from her cage. The game is played almost entirely with the keyboard. Once the game has loaded, you can move with the arrow keys. Outside to the left you will find a pipe that is labelled with the word 'tutorial'. If you would like to see this, click the down arrow key, and the game will be demonstrated in detail. With the up arrow key you jump. If there is a stone over your head, you can smash it. In the box with a question mark there either a reward or a piece of gold. You can fight the enemy by jumping on them. However, first, it must be distinguished whether it is an evil mushroom, a turtle or a fortified plant... Sometimes the turtles bear thorns and cannot be destroyed by hopping on them. With these opponents, it is better for Mario to dodge them completely so that he does not get badly injured. If you see a blue P at the end of a mission, you have to jump on it once and the star is released. This here is also the mission output. By the way, be careful, as you only have 5 lives in the game and you do not want to consume so carelessly. The graphics are good, but the gameplay is, in my opinion, a little too fast. I often hop on the spot several times, although I do not want to. The difficulty is quite high and the player is always made aware of this when trying to make the next step. Mario - Save Peach is nonetheless a great game. I find the game very difficult from Mission 3. Do you like Mario - Save Peach? If you like Mario - Save Peach, please click on the Facebook Like Button. With help of the likes on games, we generate our top 10 charts.